YUM! Hard to argue with the health benefits of dark chocolate AND getting a serving of fruit too! Just remember though, everything in moderation. 1. Wash and dry strawberries. Line a cookie sheet with wax paper. 2. In a large microwavable cup/mug, place the baking chips and oil. Microwave for 1 minute at power level of 7. 3. Carefully remove the cup and stir the chips and oil until the mixture is a smooth liquid consistency. 4. Carefully dip and swirl the strawberry in the liquid chocolate. While still holding the strawberry, allow excess chocolate to drip back into the cup. 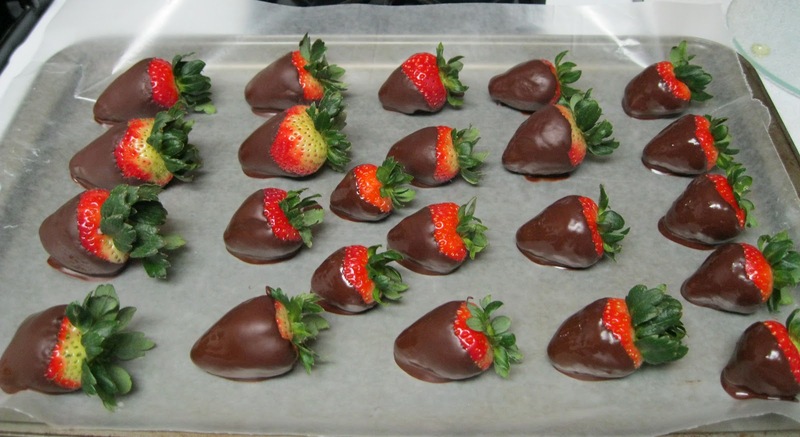 Place chocolate covered strawberry on the wax paper lined cookie sheet. Continue the process for the rest of the strawberries. Cover with tented foil so as not to touch the strawberries and place in the fridge to let the chocolate set. Ok, so I looked at several different conversion charts and basically came up with looking at each individual ingredient's nutritional facts. Again, moderation! And remember, you need to make sure that you are adding this dessert into your total carbs for your meal. Being able to have one is better than none.